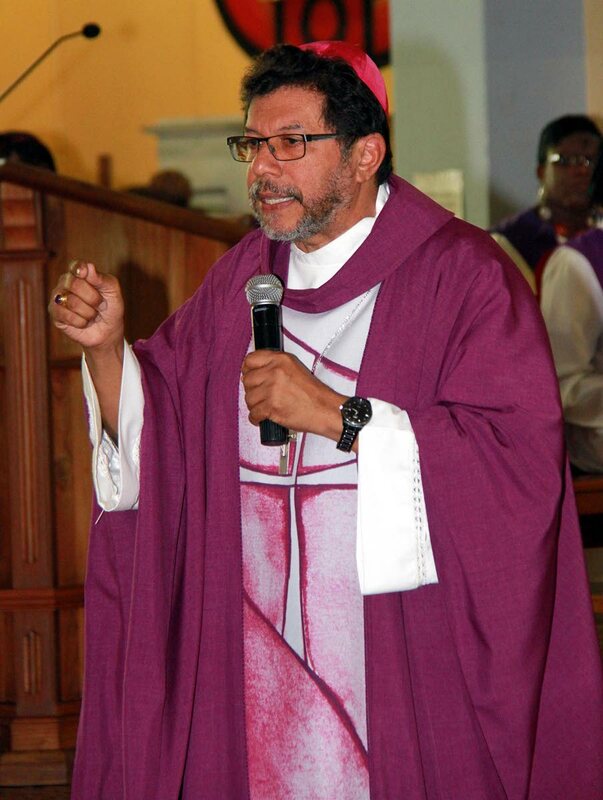 ARCHBISHOP the Most Rev Jason Gordon has dyslexia, a problem with translating sounds into letters and vice versa. But he said the condition has made him who he is today, speaking in yesterday's Ask the Archbishop interview broadcast live on Facebook. Saying that it was when he was a sixth-form pupil that his father first suggested to him he might be dyslexic, Gordon said, "I only found out I was dyslexic when I was doing my doctorate." Asked how he had reached so far in his education with this impediment, he replied, "Hand scanner." Any research papers he had ever had to read, he said, he had first electronically scanned into the device, which he then uploaded to a computer to read out to him. "I operate only by a technological world," he said. "Dyslexics are great at problem-solving. Constantly you're challenged to think outside of new perimeters. Because reading was such a challenge, every bit of reading I did, I milked it for every cent. I've learnt to go deep in whatever I'm doing. Being dyslexic had advantages, he said. "You become an integral thinker. You don't think in silos. "The brain of the dyslexic is wired to think creatively and many different ways. I preach the way I do because I'm dyslexic, not 'in spite of.' I see things others may not see. "Dyslexic kids are usually very bright and use the intelligence to get around the dyslexia and to function." He said he buys two audio books each month and named dyslexics as including Albert Einstein, Leonardo Da Vinci and Thomas Edison. Gordon then urged help for children with impediments or disabilities, including helping them while in the RC church's two-year confirmation programme. Small interventions can help growth during the usual challenges of adolescence. He otherwise lamented a general failure to try to gradually develop youngsters. "What we've tended to do is label, create a box and leave somebody in a place. What I've tried to do is meet people where they are, say 'This is interesting, but could you take two more steps?' Show them a path forward. He urged, "Keep people growing so they move through the development challenges and become the people God intended. You have to help people see where they are doing well, to show where they can go." Gordon mulled how mentors can be trained in the parish to take children outdoors to be immersed in nature. "How do we create a sense of contribution and help our young people, all of our people, to see themselves not just as recipients, but as contributors? I think young people have an incredible amount to give." Told youngsters feel unappreciated, he agreed this must change. If there exists a low glass ceiling in one's locale, he urged church activists to go and start something fresh that no one else was doing. Gordon gave his impressions of Pope Francis, whom he met (with other archbishops) during a recent two-week visit to the Vatican. "He has an incredible presence, a wicked sense of humour, very insightful, deeply pastoral, and a real open heart that is caring and considerate and at the same time knowledgeable and wise. He has this really amazing presence that he brings into a room and fills a room with. "The Holy Father has clearly put his stamp on the whole of the church in Rome, in that everyone was very respectful and listening, 'What do you want to know from your perspective?' before they offered anything to ask." Gordon said the church has many novel ideas, such as out-of-the-box ideas to help migrants such as small business loans. He repeated his call for TT nationals to help Venezuelans, saying, "We have an opportunity to dig deep and help people who are in really serious need. We still have enough to keep going and to help." While TT's economy is in trouble, he said it still had enough to help others, such as when TT helped hurricane-hit Dominica. He related an 1810 immigration of "coco panyols" to TT from Venezuela that had largely created an 1870 boom in TT's cocoa industry, and said that now no one can say how the current influx could lift TT. Reply to "Archbishop: I’m dyslexic"